BADBADNOTGOOD take their virtuosic knowledge of classic jazz and churn it through a hip-hop grinder. Their music starts with the tricky and quick jazz fundamentals, probably played on loup at your parents’ dinner parties, then blow that up with the burning power of hip-hop. They push jazz boundaries to places the original New Orleans cats could never have envisioned a century ago. Under the roof of the Humber College jazz program in Toronto, keys player Matthew Tavares, bassist Chester Hansen, and drummer Alexander Sowinski, came together because of a rare shared love of new hip hop artists like Tyler the Creator, back in 2010. The trio uploaded their first tunes online, which caught the attention of the very rapper who had brought them together. 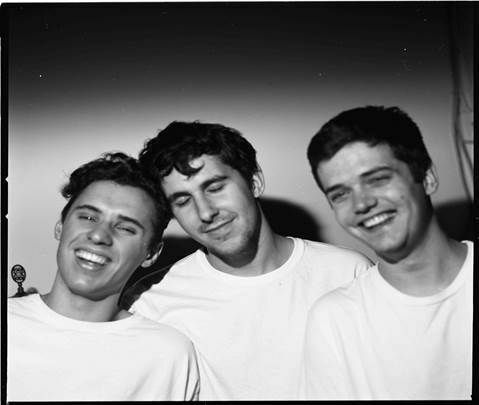 BADBADNOTGOOD’s upcoming EP, Liberal Guilt, features their psychedelically charged alternative rock. Photo by Sean Berrigan from Flickr. Sowinski explains how their songs and performances are all about finding a good ‘vibe.’ The humble friends who make-up BBNG aren’t about striving to be technical wizards of their instruments, but are all about leaping into new veins of thought and channeling positive thinking through their playing—even when it comes to the energy behind playing just two notes. “Two notes can be so powerful—you can displace them, you can hold them long, you can swing them, you can play them sloppy … We play [Gucci Mane’s] ‘Lemonade,’ which is really only like four notes, but we play that song for ten minutes and we’ll play it at double speed and then half time, and just try and go crazy. It’s all about finding good processes and things to think about as you’re creating and doing your thing,” Sowinski said. While the drummer attempts to put into words the special ingredient that helped BBNG rocket into music scene stardom, his bandmates are audibly working-out melodies in the background. A high-pitched clarinet-sounding instrument screeches a bunch of notes continuously. It sounds similar to Santana’s “Black Magic Woman” intro riff. In other words, the music writing process for BBNG is just as unique as their final product. Their new album, BBNG III, falls into slow dark brooding, then kicks that into a faster gear. The album balances somberness with sanguine all while playing all the wrong and wonderful notes of signature jazz scales. They’re pushing the vibe, like many of their predecessors, but with a fresh twist. “A lot of these famous recordings and classic albums, like Charles Mingus’ Ah Um, is such a vibe-y, moody, intense record in terms of all these crazy harmonies and stuff,” Sowinski said. The three friends had the chance to get funky in the studio of the legendary Funkadelic/Parliament member, Bootsy Collins. Between the walls adorned with cardboard cut-outs of famous rappers, platinum records flashing in every corner, BBNG got to play inside this “palace/giant playroom for musicians,” Sowinski said. Despite all the high-profile collaborations BBNG has under their belt, even teaming-up with Ghostface Killah for their next album, Sour Soul, released in Feb. 2015, the band remains charmingly humble. BBNG are heading to Montreal to play two shows, but especially to load-up on some Labatt beers: “We just joke about it because the first time we went [to Montreal], we were like ‘oh finally we can drink this amazing 10.5 percent beer’— it was so hard to drink because they’re pretty gnarly,” Sowinski laughed. It would seem they’re the only instrumental, primarily jazz band who can amp-up an audience to mosh like a 1980s punk show. They’re not only phenomenal musicians, but able to project their vibe onto the people who’ve come out to see their shows. BBNG plays Casa del Popolo Nov. 19.